Northern Ireland’s win over Ukraine and the goalless draw between Germany and Poland means it is all to play for going into the final round of fixtures in Euro 2016 Group C on Tuesday evening. Here are the possible combination of results influences the progression of Michael O’Neill’s side in the tournament. Beginning with the most optimistic scenario, if the Northern Irish can stun a misfiring Germany then they would top the group with six points unless Poland inflict a third defeat on Ukraine to finish on seven. Winning Group C would set up a meeting with one of the best-performing third-placed teams while finishing second to Poland would see Northern Ireland face Group A runners-up Switzerland. Perhaps a more realistic ambition for Northern Ireland would be to hold the reigning world champions to a draw. Regardless of the result between Ukraine and Poland, this would see the Northern Irish finish third with four points and needing to have performed better than at least two of the other third-placed teams in order to remain in the tournament. If Ukraine beat Poland then the Poles would remain on four points but finish above Northern Ireland thanks to having beaten them in the opening match, as the result of the match between two teams level on points is used as a tie-breaker before their overall goal difference. A draw or a win for Poland would see them join Germany ahead of Northern Ireland on points, with Ukraine remaining bottom of the group. In this scenario, and provided Northern Ireland’s record meant they were one of the four best third-placed sides, they would play a group winner in the last 16 - most likely Group A winners France. Even if they are defeated by Germany, Northern Ireland would be guaranteed to finish third. Thursday’s victory over Ukraine would count ahead of goal difference should Poland also lose, while anything less than a win for the Ukrainians would see them finish with fewer points than Michael O’Neill’s men. 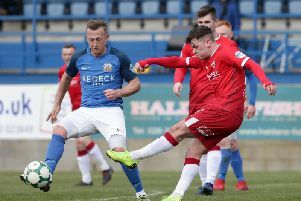 However with just three points to their name, Northern Irish progression to the knock-out phase would require two of the other five third-placed teams to finish with an inferior overall record.